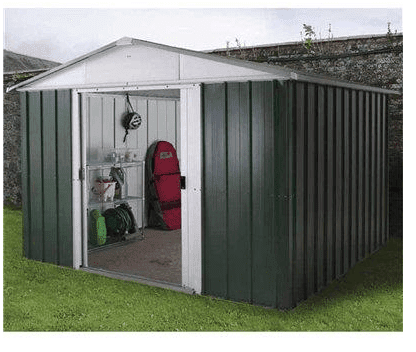 One of the most popular metal sheds on the market today, the Yardmaster 65 GEYZ metal shed provides a fantastic storage solution for your outdoor and garden equipment. With a strong metal construction and being completely secure thanks to the lockable doors this is one of the safest sheds out there. Gardeners who are looking for a practical storage solution will be delighted with this sturdy, secure and lockable shed. It has double doors which conveniently slide maximising on space for transporting items inside and out and the doors are lockable for complete security. Inside there is ample storage space and it is manufactured from galvanised steel so it is rustproof too. 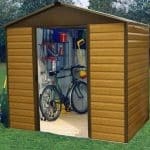 Weatherproof and protection against rust, damp and mould are what this shed does best. 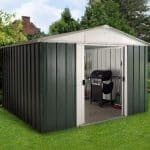 The 12-year rust guarantee shows Yardmaster’s complete confidence that this metal shed will last the distance, standing in your garden for many years to come. The spacious 6x5ft interior will provide adequate storage for the average household’s outdoor items. Further storage space can be created with the addition of freestanding shelving, meaning smaller items such as tools and accessories can be stored in a neat and organised way. Purchasing a new garden shed or outdoor storage facility can be an exciting yet somewhat overwhelming task considering the amount of choice that is available to you. If you have decided that a metal shed is what you are looking for then this a step in the right direction. Below whatshed.co.uk identify and discuss features of this particular model that may be of interest, therefore helping you in your decision making process. Exterior: This metal shed is constructed from hot-dipped galvanised steel cladding which is painted both inside and out enabling it to blend into the natural surroundings of your garden. The tough exterior is weatherproof and rustproof, protecting your items in even the harshest weather. Interior: The spacious 6x5ft interior provides enough space to store all of your outdoor and garden equipment in a neat and organised way. Freestanding shelving/storage systems may be added to create further internal storage space for smaller items. Doors: The sliding double doors are lockable with holes suitable for a padlock of your choice (padlock can be purchased separately at a modest cost). The doors on the Yardmaster metal shed admittedly are not the widest we have seen but they are suitable for purpose and come complete with an easy entry ramp for easy access and transportation of items in and out of the shed. Security: As previously said above, the sliding doors are lockable with holes ready to attach a padlock of your choice. Having your shed locked will give you the ultimate peace of mind that your items are completely secure when not in use. 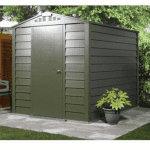 The Yardmaster Metal Shed 65 GEYZ Metal Shed: How easy to build? This Yardmaster metal shed is delivered directly to your door in a flat-packed package containing all the panels, roofing, fixtures and fittings required for assembly. It is recommended that a team of two people work together to assemble the shed for safety reasons due to the size and weight of some of the parts. A basic tool set will be required and we expect that this particular model could be ready to use within a day. A full set of instructions will be provided with a step by step guide complete with easy-to-follow diagrams. The Yardmaster Metal Shed 65 GEYZ Metal Shed: What is the overall quality like? Yardmaster design and manufacture a range of metal sheds within the United Kingdom. Their focus is on creating strong, durable and secure buildings that will last a lifetime, protecting your outdoor and garden equipment for many years to come. Nothing is too much for Yardmaster sheds, as whatever the weather may throw at them and even in the most extreme conditions, their metal sheds keep performing year after year. With a galvanised steel exterior and a 12 year rust guarantee straight from the manufacturers, Yardmaster are confident that this metal shed will keep its high performance, season after season, year after year. 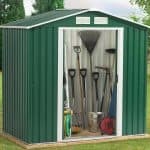 Very low maintenance, this metal shed will not require much more than a clean every now and then. A hose down with water should suffice or a sponge clean with a soapy solution for that extra sparkle. 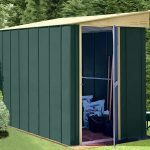 This highly practical shed is constructed of a tough galvanised steel exterior that offers a superb protection for items stored inside against the elements as well as damp, mould and rust. Complete with a 12 year rust guarantee from the manufacturers, you can be sure that this high performance shed will still be standing strong in many years to come. 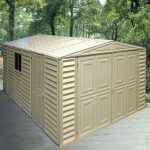 At this amazing price it is at the lower end of the price range for similar sized metal sheds.